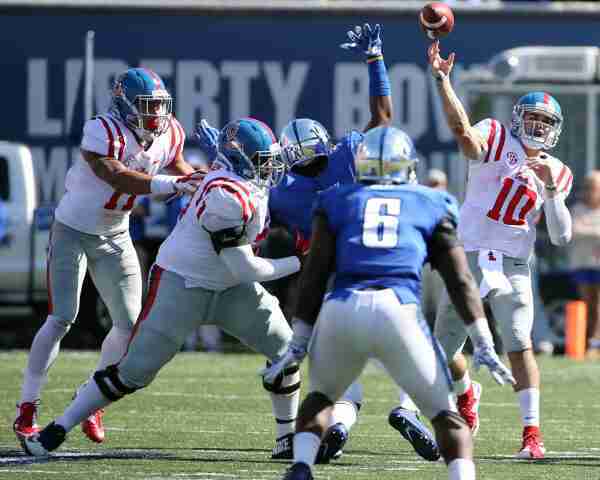 Memphis, TN-Ole Miss felt prepared for the showdown against Memphis Saturday, but after scoring the first 14 points, the Rebels could only watch as the Tigers scored 31 unanswered points. Ole Miss missed tackle after tackle and Memphis’ 6-foot-7 quarterback Paxton Lynch had his way with the Rebels’ defense, completing 39 of 53 passes for 384 yards and three touchdowns to lead No. 22 Memphis over No. 13 Ole Miss 37-24 in front of 60,241 fans inside Liberty Bowl Memorial Stadium. The Tigers finished off the Rebels with two fourth quarter field goals of 42 and 27 yards that stymied any chances of a last-minute Ole Miss rally. While the Rebels (5-2, 2-1 SEC) held the 14-10 lead at 8:23 in the second quarter, two of Ole Miss’ offensive linemen were called for holding, pinning the Rebels back on their own 15. Ole Miss was forced to punt, and from there the Rebels wouldn’t recover from eight penalties that added up to 90 yards of negative action. The Rebels jumped out on Memphis (6-0, 2-0 AAC) early in the first quarter with a trickery formation play that allowed Laquon Treadwell to throw a 68-yard pass to a wide-open Quincy Adeboyejo. 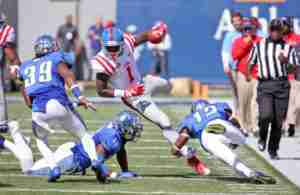 Ole Miss then followed up that magic play with Chad Kelly’s 23-yard pass to Damore’ea Stringfellow, who was deep back in the end zone. On the day, Kelly was 33-of-47 for 372 yards and two touchdowns–and now owns the single-season record with five 300-yard games. At 14-0, it looked as if the Rebels would dominate and roll to their seventh straight win in this series, but Memphis answered Ole Miss’ high-octane offense with some explosive plays of its own. The Tigers struck a fire into the home crowd with a one-yard touchdown pass from Paxton Lynch to Alan Cross. Memphis’ running back Jarvis Cooper had rushed for a 14-yard touchdown on the previous play, but it was called back and Jarvis’ knee was called down at the half goal line. After Jake Elliot’s 23-yard field goal, the Tigers’ defense forced a Chad Kelly interception that set Memphis up at the 30. The Tigers then took a 17-14 lead off a four-yard rushing touchdown by Sam Craft, and from there Memphis skyrocketed to the top and the Rebels seemed to hit a brick wall. Before halftime, Lynch connected with wide receiver Anthony Miller for a 6-yard score. The Tigers oozed with confidence and their play on both sides of the football put the nation on notice as they held a 24-14 lead heading into the locker room. The Tigers kept pouring it on in the second half, using a 10-play, 82-drive that was capped by Lynch’s 31-yard touchdown pass to Mose Frazier, who pranced his way into the end zone and gave Memphis’ 31-14 lead. Frazier had eight receptions for 83 yards. Ole Miss responded with a 6-yard touchdown reception from Treadwell to cut the Rebels’ deficit to 31-21, and a 24-yard field goal from Gary Wunderlich at the end of the third quarter had Ole Miss down only a touchdown, 31-24. 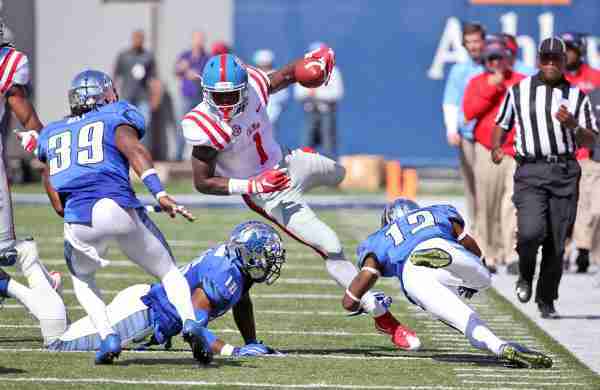 Treadwell had 144 receiving yards on a career-best and school record 14 receptions, but Treadwell’s performance was overshadowed by a disastrous second half in which the offense couldn’t muster a steady rhythm, finishing the game 4-of-13 on third downs. “We just got to stop shooting ourselves in the foot, but it’s all correctable,” said Kelly.